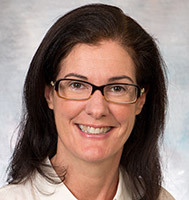 Betsy Thompson is a physical therapist who specializes in treating people who have neck pain, headaches, low back pain and disorders of the pelvic floor including urinary and bowel symptoms. She also treats pelvic pain in both men and women, including dyspareunia, interstitial cystitis, vulvodynia, and vaginismus. Betsy sees patients with general orthopedic conditions, and is credentialed as a clinical orthopedic specialist through the American Physical Therapy Association. She is licensed by the state of Wisconsin and is a member of the American Physical Therapy Association, Wisconsin Physical Therapy Association, and the APTA's Section on Women's Health.